New York, NY – Governor Tom Wolf, Lt. Governor John Fetterman and Pennsylvania Department of Corrections Secretary John Wetzel joined leaders from the worlds of sports, entertainment and business in New York today as they announced the launch of REFORM Alliance, an organization focused on transforming the American justice system. 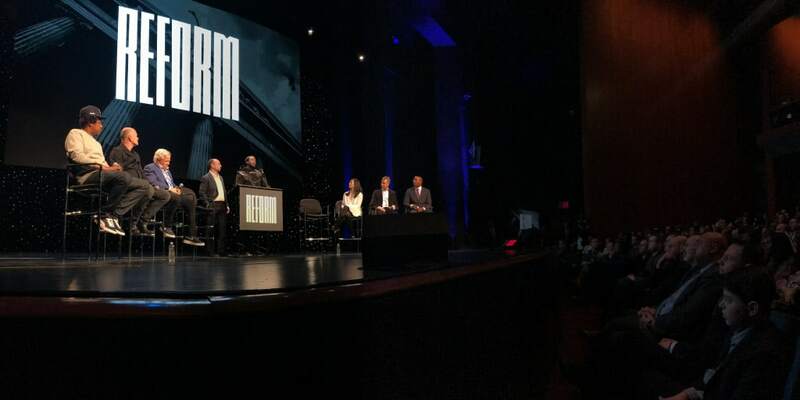 REFORM’s founding partners include award-winning recording artist Meek Mill; Philadelphia 76ers co-owner and Fanatics executive chairman Michael Rubin; entrepreneur and business mogul Shawn “JAY-Z” Carter; Kraft Group CEO and New England Patriots owner Robert Kraft; Brooklyn Nets co-owner and philanthropic investor Clara Wu Tsai; Third Point LLC CEO and founder Daniel S. Loeb; Galaxy Digital CEO and founder Michael E. Novogratz; and Vista Equity Partners founder, chairman and CEO Robert F. Smith. REFORM named activist, author and CNN host Van Jones to serve as the organization’s Chief Executive Officer (CEO). In his role, Jones will oversee the implementation of the alliance’s mission and spearhead operations management. As a leader in bi-partisan criminal justice reforms, Pennsylvania was the first and remains the only state to pass and implement a Clean Slate law that allows formerly incarcerated or arrested individuals with certain types of convictions to have their records sealed if they have not been convicted for 10 years and no fines or costs are owed. The legislation was co-sponsored by representatives Sheryl Delozier and Jordan Harris and supported by Senator Anthony Williams. Focus on probation reform to ensure the right individuals have the right level of supervision and technical probation violations do not mean an immediate return to incarceration. This works hand-in-hand with first ensuring sentences are commensurate with the severity of crimes committed. Pass and implement the Justice Reinvestment Initiative, or JRI 2, to address the high cost of incarceration in the state, to strengthen support for county probation programs, and to fix inadequate sentencing guidelines. Reform the pre-trial system to make certain that those accused of a crime have access to competent legal counsel and a reasonable bail system. Reform the post-trial criminal justice system to ensure work towards rehabilitation of individuals and preparation to reenter society, rather than creating further risks for recidivism. Announced a Fair-Chance hiring policy for state agencies that removes the criminal conviction question, otherwise known as “banning the box,” from non-civil service employment applications for agencies under the governor’s jurisdiction. Signed Tierne’s Law, strengthening protections for victims of domestic violence. Tierne Ewing, a victim of domestic violence, was murdered by her estranged husband in 2016 after he had been arrested for domestic abuse, then released. Signed the Timothy J. Piazza Antihazing Law, which strengthens penalties for hazing and ensures that schools have safeguards to protect students. Timothy Piazza was a 19-year-old Penn State University student who died in February 2017 at a fraternity. Made it harder for domestic abusers to use firearms to kill, terrorize, and control their victims and others by signing Act 79 of 2018, which includes a reform long-sought by domestic violence and gun safety advocates. Signed the “Clean Slate” bill, the first of its kind in the nation, to help those who have committed low-level offenses and have paid their penalty get back on the path to a blemish-free record, removing potential roadblocks to jobs, housing, health care, and education. Signed Act 95 of 2018, eliminating driver’s license suspensions for non-driving infractions. Signed Act 130 of 2018, the “Safe Harbor” law, which shields children who are victims of human trafficking and sexual exploitation from prosecution for crimes their abusers forced them to commit, enhances law enforcement training, and establishes a new fund for victim services. Signed Act 146 of 2018, extending the time a convicted individual has to file a post-conviction relief action to one year, from what was 60 days under current law. Signed Act 147 of 2018, updating Pennsylvania’s DNA testing law to reflect significant advances in technology and the lessons learned by criminal justice professionals since 2002. The legislation removes the supervision requirement that only people serving a sentence can apply for DNA testing. Signed Act 148 of 2018, a victim protection bill regarding housing options and emergency transfers. Announced a record decline in the state’s prison population, while also experiencing a drop in crime. To learn more about the REFORM Alliance, please visit http://www.reformnow.com/.